Knee dislocations are described using either positional or anatomical classification systems. Positional classifications describe the position of the tibia relative to the femur and thus require the dislocation to be witnessed for proper classification. Many knee dislocations spontaneously reduce prior to ED presentation, making the positional classification system difficult to apply. For this reason, the anatomical classification system is generally preferred because it specifically describes the injury by its ligamentous, arterial, and neural involvements. 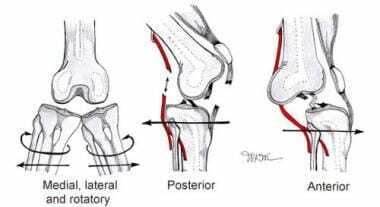 Anterior: Anterior dislocation often is caused by severe knee hyperextension. Cadaver research has shown that approximately 30 degrees of hyperextension is required before dislocation will occur. Posterior: Posterior dislocation occurs with anterior-to-posterior force to the proximal tibia, such as a dashboard type of injury or a high-energy fall on a flexed knee. The image below shows a radiograph of a posterior dislocation. Medial, lateral, or rotatory: Medial, lateral, and rotatory dislocations require varus, valgus, or rotatory components of applied force. 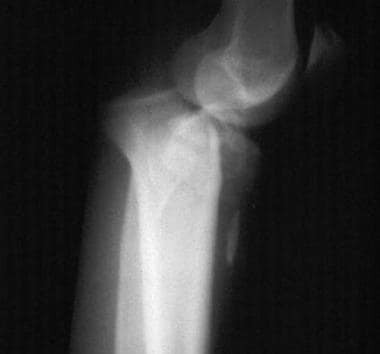 A lateral dislocation is illustrated in the image below. Lateral knee dislocation (before reduction). More than half of all dislocations are anterior or posterior, and both of these have a high incidence of popliteal artery injury. Twenty to thirty percent of all knee dislocations are complicated further by open joint injury (see the image below). 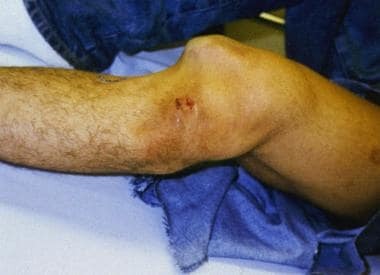 Most often, the affected limb has a gross deformity of the knee with swelling and immobility, but up to 50% of knee dislocations are reduced by the time of ED presentation and may not be obvious. Many knee dislocations have associated fractures; thus, it is important to obtain radiographs prior to ligamentous stressing to avoid promoting fracture displacement. In the absence of coexistent fracture, a thorough examination of all ligamentous structures is imperative, especially in patients with head injuries or in those who are intoxicated and may not be able to communicate symptoms adequately. The finding of varus or valgus instability in full extension of the knee is suggestive of a spontaneously reduced yet grossly unstable dislocation. In addition, pain out of proportion, or absent or decreased pulses are red flags of such an injury. In cases presenting with "hard signs" of arterial injury, immediate surgical revascularization is indicated, and there should be no delay to the operating room (ie, waiting for arteriography). Hard signs of vascular injury include the absence of pulses, expanding or pulsatile hematomas, palpable thrills or audible bruits, and/or the history of pulsating hemorrhage. Cases in which there are no hard findings but the ABI/API is less than 0.90 should receive immediate vascular surgical consultation and further vascular imaging and perfusion surveillance. The traditional approach to universally pursue arteriography is increasingly being replaced with other less risky and less costly options: duplex ultrasonography (100% sensitivity and 97% specificity for clinically significant arterial injury  ), or CT angiography (95-100% sensitivity and 97-98% specificity for clinically significant arterial injury [16, 17] ). Ongoing debate surrounds the appropriate application of these imaging options; thus, the decision regarding modality choice should be made in conjunction with the consulting vascular surgeon. Regardless of the imaging pursued, all knee dislocations not requiring immediate surgical revascularization should be admitted for serial perfusion checks as delayed intimal flap thromboses, arteriovenous (AV) fistulas, and pseudoaneurysms of significance certainly occur and may need subsequent intervention/repair. Coexistent peroneal nerve injury occurs in 25-35% of patients and must be ruled out. This injury most commonly manifests with decreased sensation at the first webspace with impaired dorsiflexion of the foot. Cone JB. Vascular injury associated with fracture-dislocations of the lower extremity. Clin Orthop. 1989 Jun. (243):30-5. [Medline]. Georgiadis AG, Mohammad FH, Mizerik KT, Nypaver TJ, Shepard AD. Changing presentation of knee dislocation and vascular injury from high-energy trauma to low-energy falls in the morbidly obese. J Vasc Surg. 2013 May. 57(5):1196-203. [Medline]. Henrichs A. A review of knee dislocations. J Athl Train. 2004 Oct-Dec. 39(4):365-9. [Medline]. McDonough EB Jr, Wojtys EM. Multiligamentous injuries of the knee and associated vascular injuries. Am J Sports Med. 2009 Jan. 37(1):156-9. [Medline]. Stannard JP, Sheils TM, Lopez-Ben RR, McGwin G Jr, Robinson JT, Volgas DA. Vascular injuries in knee dislocations: the role of physical examination in determining the need for arteriography. J Bone Joint Surg Am. 2004 May. 86-A(5):910-5. [Medline]. Knutson T, Bothwell J, Durbin R. Evaluation and management of traumatic knee injuries in the emergency department. Emerg Med Clin North Am. 2015 May. 33 (2):345-62. [Medline]. Bouaicha S. [The acute knee injury - practical considerations]. 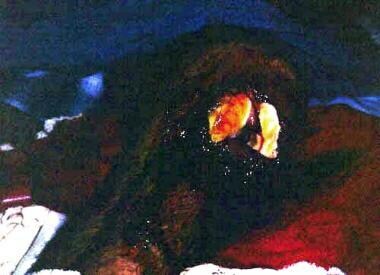 Praxis (Bern 1994). 2014 Apr 9. 103 (8):439-44. [Medline]. Tuite MJ, Daffner RH, Weissman BN, Bancroft L, Bennett DL, Blebea JS, et al. ACR appropriateness criteria(®) acute trauma to the knee. J Am Coll Radiol. 2012 Feb. 9 (2):96-103. [Medline]. Snyder WH III, Thal ER, Bridges RA, et al. The validity of normal arteriography in penetrating trauma. Archives of Surgery. 1978. 113:424-426. Rose SC, Moore EE. Trauma angiography: the use of clinical findings to improve patient selection and case preparation. J Trauma. 1988 Feb. 28(2):240-5. [Medline]. Fry WR, Smith RS, Sayers DV, Henderson VJ, Morabito DJ, Tsoi EK, et al. The success of duplex ultrasonographic scanning in diagnosis of extremity vascular proximity trauma. Arch Surg. 1993 Dec. 128(12):1368-72. [Medline]. Inaba K, Potzman J, Munera F, McKenney M, Munoz R, Rivas L, et al. Multi-slice CT angiography for arterial evaluation in the injured lower extremity. J Trauma. 2006 Mar. 60(3):502-6; discussion 506-7. [Medline]. Soto JA, Munera F, Cardoso N, Guarin O, Medina S. Diagnostic performance of helical CT angiography in trauma to large arteries of the extremities. J Comput Assist Tomogr. 1999 Mar-Apr. 23(2):188-96. [Medline]. Redmond JM, Levy BA, Dajani KA, Cass JR, Cole PA. Detecting vascular injury in lower-extremity orthopedic trauma: the role of CT angiography. Orthopedics. 2008 Aug. 31(8):761-7. [Medline]. [Full Text]. Zierler RE. Vascular surgery without arteriography: use of Duplex ultrasound. Cardiovasc Surg. 1999 Jan. 7(1):74-82. [Medline]. Barnes CJ, Pietrobon R, Higgins LD. Does the pulse examination in patients with traumatic knee dislocation predict a surgical arterial injury? A meta-analysis. J Trauma. 2002 Dec. 53(6):1109-14. [Medline]. Browner BD, Jupiter JB, Levine AM. Dislocations and soft tissue injuries of the knee. Skeletal Trauma. WB Saunders Co; 1992. Vol 2: 1717-1741. Chhabra A, Cha PS, Rihn JA, Cole B, Bennett CH, Waltrip RL. Surgical management of knee dislocations. Surgical technique. J Bone Joint Surg Am. 2005 Mar. 87 Suppl 1(Pt 1):1-21. [Medline]. Dennis JW, Jagger C, Butcher JL, et al. Reassessing the role of arteriograms in the management of posterior knee dislocations. J Trauma. 1993 Nov. 35(5):692-5; discussion 695-7. [Medline]. Giannoulias CS, Freedman KB. Knee dislocations: management of the multiligament-injured knee. Am J Orthop. 2004 Nov. 33(11):553-9. [Medline]. Harner CD, Waltrip RL, Bennett CH, et al. Surgical management of knee dislocations. J Bone Joint Surg Am. 2004 Feb. 86-A(2):262-73. [Medline]. Klineberg EO, Crites BM, Flinn WR, et al. The role of arteriography in assessing popliteal artery injury in knee dislocations. J Trauma. 2004 Apr. 56(4):786-90. [Medline]. Levy BA, Dajani KA, Whelan DB, Stannard JP, Fanelli GC, Stuart MJ. Decision making in the multiligament-injured knee: an evidence-based systematic review. Arthroscopy. 2009 Apr. 25(4):430-8. [Medline]. Mills WJ, Barei DP, McNair P. The value of the ankle-brachial index for diagnosing arterial injury after knee dislocation: a prospective study. J Trauma. 2004 Jun. 56(6):1261-5. [Medline]. Nicandri GT, Chamberlain AM, Wahl CJ. Practical management of knee dislocations: a selective angiography protocol to detect limb-threatening vascular injuries. Clin J Sport Med. 2009 Mar. 19(2):125-9. [Medline]. Rihn JA, Groff YJ, Harner CD, Cha PS. The acutely dislocated knee: evaluation and management. J Am Acad Orthop Surg. 2004 Sep-Oct. 12(5):334-46. [Medline]. Robertson A, Nutton RW, Keating JF. Dislocation of the knee. J Bone Joint Surg Br. 2006 Jun. 88(6):706-11. [Medline]. Rockwood CA, Green DP, Bucholz RW. Injuries of the knee. Fractures in Adults. Lippincott Williams & Wilkins Publishers; 1996. Vol 2: 2112-2126. Varnell RM, Coldwell DM, Sangeorzan BJ, Johansen KH. Arterial injury complicating knee disruption. Third place winner: Conrad Jobstaward. Am Surg. 1989 Dec. 55(12):699-704. [Medline]. Welling RE, Kakkasseril J, Cranley JJ. Complete dislocations of the knee with popliteal vascular injury. J Trauma. 1981 Jun. 21(6):450-3. [Medline]. Lateral knee dislocation after reduction.